This post explains how to add, customize and use Xafari Audit Module. We will create a simple demo XAF application and consider a step by step deployment of Audit in this example.We will use Xafari x07. It is worth noting that the main distinguishing feature of Xafari Audit is its performance. 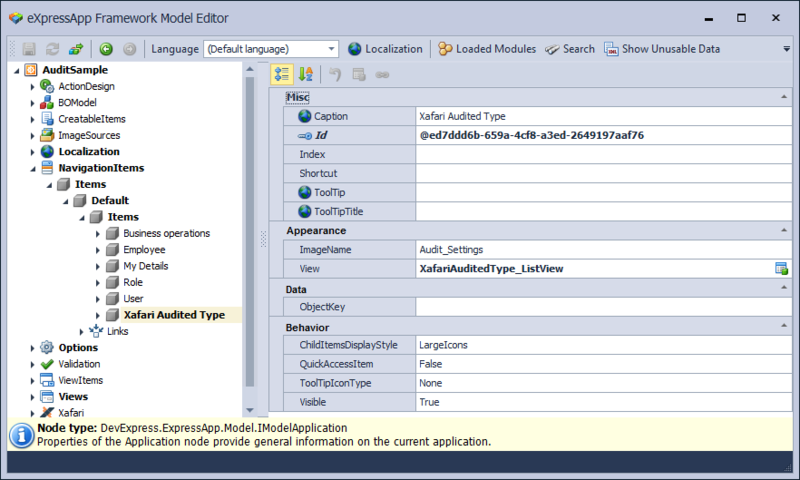 Create new XAF Windows application, name it AuditSample. Add XafariBCAuditModule and XafariBCAuditTriggersModule to the platform independent module (in our case it is AuditSample.Module). Add XafariBCAuditWinModule to the Win module. Add XafariBusinessOperationsModule, XafariBCSettingsModule, XafariEditorsModule to the platform independent module. Add XafariEditorsWinModule to the Win module. Now the common preparation of Xafari Audit is completed. We need to define the audited entity. In this example, it is Employee. Employee.cs file is located in the AuditSample|AuditSample.Module|BusinessObjects folder of solution ( AuditSample). Employee class implements IAuditSupport interface. Invoke Model Editor and navigate to the NavigationItems|Items|Default|Items node. Add new item, set View property to "XafariAuditedType_ListView" value. Build and run solution. Now you only configure Audit in the application. Select the Xafari Audited Type item in the navigation control and click the Apply Action in the invoked View. For the Employee type set Audit Enabled property to "True". Select Employee Navigation Item and invoke Employee List View, create (edit) and save new objects. For selected object click Show Audit Data Action, as shown in the image below. Now you can view all of the changes that have occurred with this object.